A newly signed California law allows state health care workers who "willfully and repeatedly" refuse to use a senior transgender patient's "preferred name or pronouns" to face punishments ranging from a fine to prison time. California Gov. Jerry Brown (D.) signed the legislation on Friday, enacting the the Lesbian, Gay, Bisexual, and Transgender Long-Term Care Facility Residents' Bill of Rights, Fox News reported Monday. The legislation, sponsored by Democratic state Sen. Scott Wiener, seeks to protect the rights of LGBT individuals in hospitals, retirement homes, and assisted living facilities. Under the law, long-term care facilities for the elderly in California are not allowed to take certain actions on the basis of one's sexual orientation, gender identity, gender expression, or HIV status, including referring to a patient by the wrong name or pronoun. These facilities also cannot consider the aforementioned factors when a patient is being admitted, transferred, evicted, or discharged. Among other things, the bill would make it unlawful, except as specified, for any long-term care facility to take specified actions wholly or partially on the basis of a person's actual or perceived sexual orientation, gender identity, gender expression, or human immunodeficiency virus (HIV) status, including, among others, willfully and repeatedly failing to use a resident's preferred name or pronouns after being clearly informed of the preferred name or pronouns, or denying admission to a long-term care facility, transferring or refusing to transfer a resident within a facility or to another facility, or discharging or evicting a resident from a facility. Violators of the law could be punished by a fine "not to exceed one thousand dollars" or "by imprisonment in the county jail for a period not to exceed one year," or both, according to Fox News. But Wiener has said that nobody will be criminally prosecuted for using the wrong pronoun. "It's just more scare tactics by people who oppose all LGBT civil rights and protections," he said in a statement last month. Wiener's office said the new law "does not create any new criminal provisions," but rather creates "new rights within an existing structure." Greg Burt of the California Family Council opposes the new law and spoke out against the bill in it early stages before the California Assembly Judiciary Committee in August. "How can you believe in free speech, but think the government can compel people to use certain pronouns when talking to others," Burt said. "Compelled speech is not free speech … True tolerance tolerates people with different views." 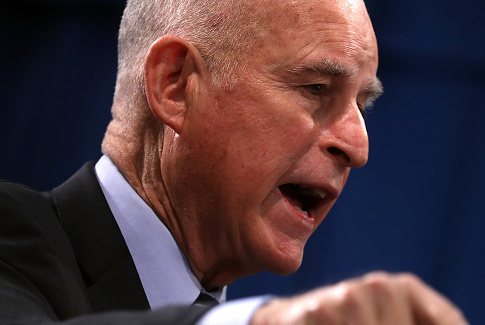 This entry was posted in Issues and tagged California, Jerry Brown, Transgenderism. Bookmark the permalink.